Nasopharyngeal carcinoma (NPC), arises from the nasopharyngeal epithelium . In 2012, there were 86,500 cases reported worldwide, in which 71% of all new cases in east and Southeast Asia, with China contributing 53.5% of these cases [2, 3]. Several factors have been proved to enhance the risk of NPC, smoking, alcohol consumption, and family history of cancer and so on [4-6]. The ABO gene, located on chromosome 9q34.1 to 9q34.2, encodes a specific glycosyl transferase that synthesizes A and B agglutinogens to form the ABO blood type agglutinogens , expressed by erythrocytes, most epithelial cells, endothelial cells and so on. Relationship between the ABO blood type and prognosis have been reported in many tumor types, such as leukemia , pancreatic cancer [10-12], bladder cancer , gastric cancer [14-16], renal cell carcinoma , breast cancer [18,19], lung cancer [20,21] and so on. The correlation between ABO blood type and NPC remains controversial. Some researches demonstrated the absence of an association between ABO blood type and NPC [22-24]. Other studies indicated that the ABO blood type was related to NPC susceptibility, for instance A blood type increased risks, mainly in male patients [25-27]. Therefore, we sought to conduct a study to assess the prognostic value of different blood types in NPC patients, to determine whether certain blood type is an independent predictor of prognosis so as to guide the clinical practice. We reviewed all the 2,626 patients who were newly diagnosed with NPC without distant metastasis between January 2001 and December 2004 at the Sun Yat-sen University Cancer Center (SYSUCC). We collected data on basic characteristics including age, gender, tumor family history, cigarette smoking status at diagnosis, alcohol drinking status at diagnosis, BMI status at diagnosis, whether to receive chemotherapy, chemotherapy cycles and ABO blood type. 187 patients with missing data were excluded from this study. All cases were restaged according to the 7th edition of the UICC/AJCC staging system . Computed tomography and/or magnetic resonance imaging was essential for disease staging before treatment, and all patients were treated by CRT (n=2287), or IMRT (n=152) with or without chemotherapy. For 2D-CRT, high energy 6-8 MV X-ray of linear accelerator was used. The radiation field included the skull base, nasopharynx and neck. Face-neck joint field and lower cervical anterior tangent field were irradiated to a dose of 36 Gy, and then followed by bilateral preauricular fields plus anterior tangent field to a total dose of 60 to 78 Gy. For IMRT, simultaneous integrated boost (SIB) technique was used. All patients were scanned with serial 3-mm slices from the vertex through the clavicles in supine position with a head, neck, and shoulder thermoplastic mask. GTV was defined as the primary nasopharyngeal gross tumor volume and the involved cervical lymph nodes and was prescripted 66-70Gy in 30-32 fractions. CTV1 was defined as the GTVnx plus a margin of 5-10 mm for potential spread and was prescribed 60Gy in 30-32 fractions. CTV2 was defined by adding a margin of 5-10 mm to CTV1 (reduced when adjacent critical organ at risk (OAR)) and included the retropharyngeal lymph nodal regions, clivus, skull base, pterygoid fossae, parapharyngeal space, inferior sphenoid sinus, and posterior edge of the nasal cavity and maxillary sinuses, and was prescripted 54Gy in 30-32 fractions. For N0 patients, lower neck was not irradiated. While for N positive patients, the whole neck was delineated in CTV2. Chemotherapy included induction chemotherapy (IC), concomitant chemotherapy (CC), and adjuvant chemotherapy (AC). Chemotherapy regimen was mainly based on platinum. The flowchart of study design was shown in Figure 1. We first analyzed the endpoints including overall survival (OS), disease-specific survival (DSS), locoregional relapse-free survival (LRFS) and distant metastasis-free survival (DMFS) among all the 4 ABO blood types pairwise over strata in the whole 2439 patients to select certain blood type with prognostic value. Then, we further compared certain blood type patients with others in the whole 2439 patients, 559 female patients and 1880 male patients respectively. OS was defined as time from diagnosis to death from any cause. DSS was defined in this analysis as the patients of a dataset who did not die from NPC in a defined period of time. LRFS was defined as time to the first occurrence of tumor growth at the primary site or regional lymph nodes. DMFS time was defined as time to the first occurrence of distant failure during follow-up. Analyses were performed using SPSS software, version 24.0. The Chi-square test was used to compare categorical variables. Survival rates were estimated by means of life table method. Cox proportional hazards model was used to test the independent significance of different variables by backward elimination. Receiver operating characteristic (ROC) curve analysis was used to evaluate the predicted validity of age, based on the method of Hanley and McNeil . Kaplan-Meier survival curve figures were performed by GraphPad Prism software, version 6.04. Flowchart of study design. NPC = nasopharyngeal carcinoma. The clinical characteristics of the 2439 patients are shown in Table 1. The proportions of O, A, B, and AB blood types were: 40.1% (977/2439), 26.3% (641/2439), 27.5% (670/2439) and 6.2% (151/2439) respectively. There were no significant difference observed between O blood group patients and non-O blood group patients. According to the ROC curve analysis based on OS, the optimal age cut-off value was 53 years (area under curve: 0.592; sensitivity, 0.547; specificity, 0.471) for the 2439 patients.The 5-year survival rates for the 2439 patients were 76.3%, 79.2%, 85.7%, and 87.7% for OS, DSS, LRFS, and DMFS, respectively. We analyzed all endpoints among all the 4 ABO blood types pairwise over strata in the whole patients. There was almost no significant difference between any pair blood group, except for DMFS between B blood type patients and O blood type patients (Table 2). Compared with B blood type patients, O blood type patients had lower DMFS (hazard ratio (HR)=1.410, 95% CI 1.052-1.889, P=0.021 in univariate analysis; adjusted hazard ratio (aHR)=1.411, 95% CI 1.053-1.891, P=0.021 in multivariate analysis). Therefore, we confined A, B and AB blood type patients undifferentiated and collected them together into non-O blood type patients, so as to further compare with O blood type patients. Similarly, there was almost no significant difference between O and non-O blood type patients, except that O blood type patients had significant lower DMFS than non-O blood type patients (HR=1.262, 95% CI 1.006-1.584, P=0.045 in univariate analysis; aHR=1.268, 95% CI 1.010-1.592, P=0.041 in multivariate analysis; Table 3, Figure 2A). In female patients, compared with non-O blood type patients, O blood type patients had significant lower OS, DSS and DMFS in univariate analysis (HR=1.471, 95% CI 1.016-2.131, P=0.041 for OS; HR=1.534, 95% CI 1.032-2.279, P=0.034 for DSS; HR=1.748, 95% CI 1.038-2.943, P=0.036 for DMFS), and in multivariate analysis (aHR=1.495, 95% CI 1.032-2.165, P=0.034 for OS; aHR=1.566, 95% CI 1.054-2.328, P=0.026 for DSS; aHR=1.779, 95% CI 1.056-2.998, P=0.030 for DMFS; Table 3, Figure 2B, Figure 3A, 3B). There was no significant difference in LRFS observed (HR=1.295, 95% CI 0.780-2.150, P=0.318; aHR=1.237, 95% CI 0.738-2.074, P=0.419; Table 3, Figure 3C). In male patients, there were no significant differences observed between O blood type patients and non-O blood type patients in OS, DSS, LRFS and DMFS (P>0.05 for all rates; Table 3, Figure 2C). Notes: The cut-off value of age was 53 year-old (11-78 year-old, mean 46.3 year-old, median 46 year-old, standard deviation 11.6 year-old). P<0.05 was considered statistical signifance. Abbreviations: BMI= Body mass index; UICC= International Union Against Cancer; IC= Induction chemotherapy; CC= Concomitant chemotherapy; AC= Adjuvant chemotherapy; CRT= Conventional radiotherapy; IMRT= Intensity-modulated radiotherapy. 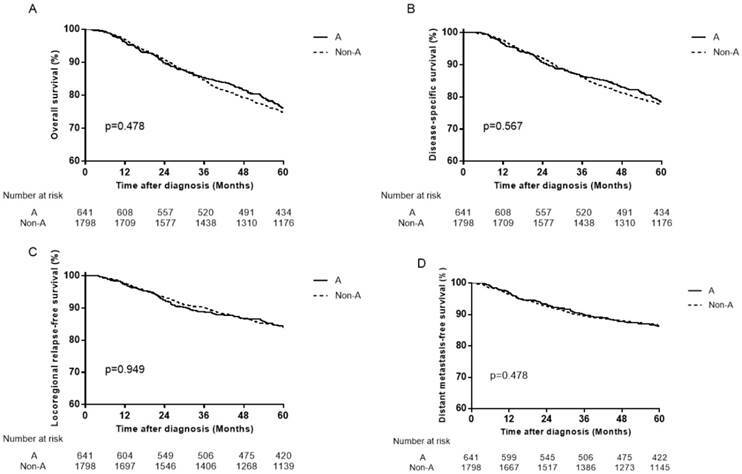 Distant metastasis-free survival curves for patients with blood type O and non-O blood types. (A) In total patients, (B) in female patients and (C) in male patients. Pairwise comparisons of all endpoints among ABO blood types in total patients. Notes: P<0.05 was considered statistical signifance. Abbreviations: OS= Overall survival; DSS= Disease-specific survival; LRFS= Locoregional relapse-free survival; DMFS= Distant metastasis-free survival. Univariate and multivariate analyses between patients with O and non-O blood type. Abbreviations: HR= Hazard ratio; aHR= Adjusted hazard ratio; CI= Confidence interval; OS= Overall survival; DSS= Disease-specific survival; LRFS= Locoregional relapse-free survival; DMFS= Distant metastasis-free survival. Survival curves for patients with blood type O and non-O blood types in the 559 female patients. 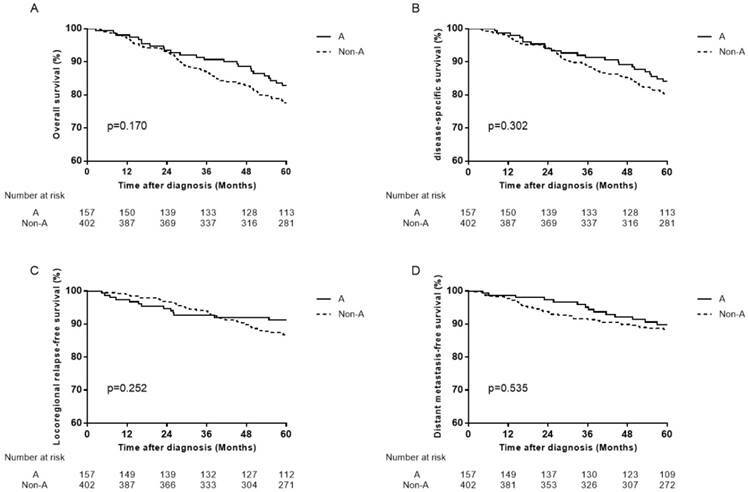 (A) Overall survival, (B) disease-specific survival and (C) locoregional relapse-free survival. Our study showed in the whole patients, compared with non-O blood type (A, B, and AB) patients, type O patients had significantly lower 5-year DMFS (Table 3, Figure 2A). Furthermore, in female patients, O blood type patients didn`t only have significantly lower DMFS but also lower OS, DSS than patients with non-O blood type, except LRFS (Table 3, Figure 2B, Figure 3). However, none of them was observed in male patients (Table 3, Figure 2C). Therefore, we deduced that female NPC patients with O blood type might have lower DMFS, which might result in lower OS and DSS compared with those with non-O blood type, even dragged down DMFS in the whole NPC population. Previous studies have evaluated the association of ABO blood types with NPC [22-27]. The two studies by Sheng et al  and Ouyang et al  revealed that patients with A blood type had significantly lower OS and DMFS compared to patients with non-A blood type. Therefore, the failure patterns were mainly compared between A and other blood type patients to clarify the differences. However, when we set A blood type as the control group, the results showed no association of ABO blood types with NPC (Figure 4, Figure 5). In subgroup analysis by Ouyang et al , the increased risks of OS and DMFS associated with A blood type were only observed in male patients, which was attributed to unbalanced gender distribution between the patients with blood type A and non-A blood types. However, the results of our subgroup analysis showed A blood type patients had similar prognosis with others, whether in male patients or not (Figure 6; Figure 7). It should be pointed out that patients in our study made up a consecutive cohort, which included several pathological types, radiotherapy techniques and other features, so as to decrease some bias compared with selected cohort studied in other studies. So these results may help to further confirm that A blood type may have no prognostic value in NPC. Peng et al  showed that ABO blood type was not an independent prognostic factor for DFS, OS, DMFS or LRFS after adjusting for plasma Epstein-Barr virus deoxyribonucleic acid (EBV-DNA). There might be some prognostic value in ABO blood type but offset by adjusting for plasma EBV-DNA. Moreover, it used the four-year survival endpoints to analyze, might get the misleading conclusion resulting from insufficient follow-up time. 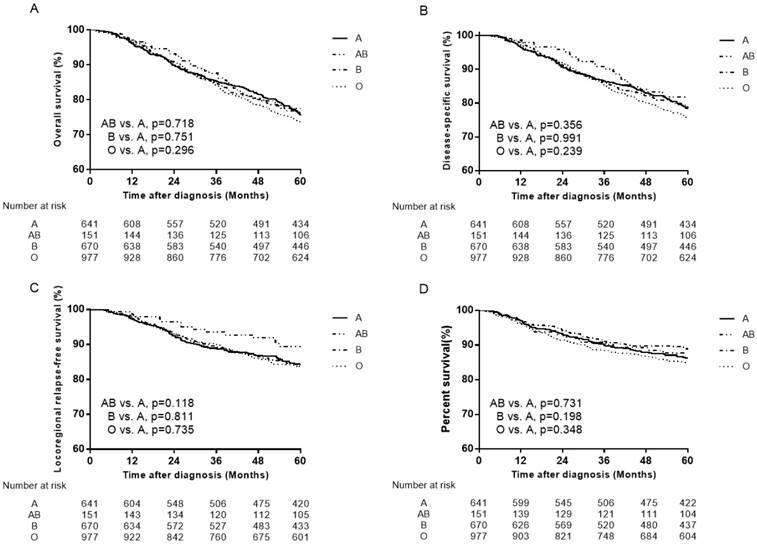 Survival curves for patients with blood type A, B, AB and O in the total 2439 patients. (A) Overall survival, (B) disease-specific survival (C) locoregional relapse-free survival and (D) distant metastasis-free survival. 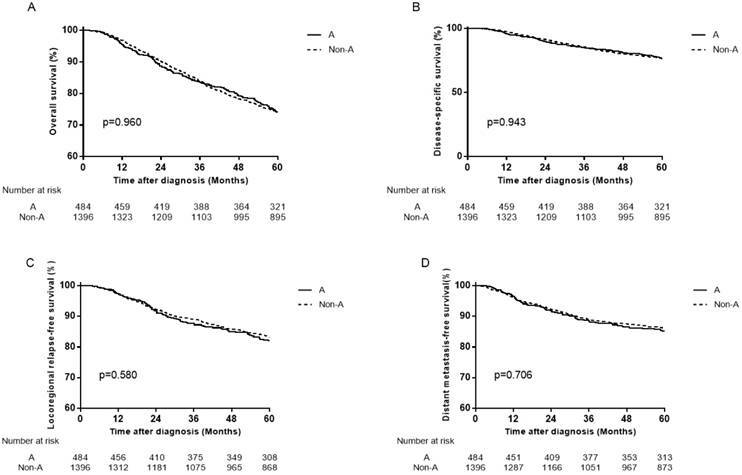 Survival curves for patients with blood type A and non-A in the total 2439 patients. (A) Overall survival, (B) disease-specific survival, (C) locoregional relapse-free survival and (D) distant metastasis-free survival. Survival curves for patients with blood type A and non-A blood types in the 559 female patients. (A) Overall survival, (B) disease-specific survival, (C) locoregional relapse-free survival and (D) distant metastasis-free survival. Survival curves for patients with blood type A and non-A blood types in the 1880 male patients. (A) Overall survival, (B) disease-specific survival, (C) locoregional relapse-free survival, and (D) distant metastasis-free survival. 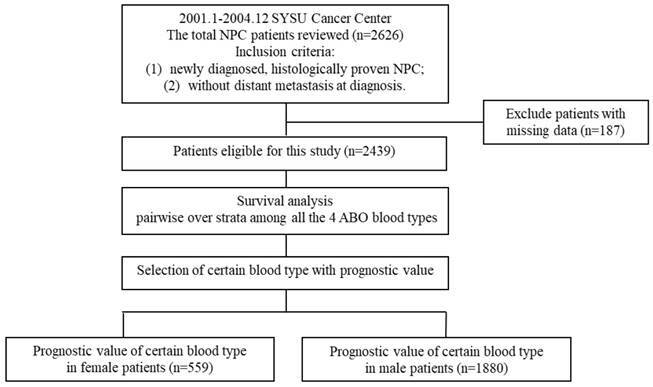 Aside from NPC, ABO blood types have been reported associated with prognosis in various kinds of tumors [10-21]. For instance, A blood type is associated with risk of gastric cancer [14,15], attributed to A blood type alleles affected the fucosyltransferase enzymes which are involved in Lewis antigen formation known to be important factors in H. pylori adhesion and infection dentified by phenotype analysis . Likewise, A blood type is associated with unfavorable survivals in some other tumors, such as breast cancer [18,19], lung cancer [20,21] and so on. O blood type is associated with a reduced risk of pancreatic cancer [10-12], which may be attributed to ABO blood group IgM isoagglutinins interact with tumor-associated O-glycan structures in pancreatic cancer . Similarly, non-O blood type is significantly associated with decreased OS in renal cell carcinoma patients . Conversely, O blood type is associated with the worst recurrence and progression rates in nonmuscle invasive bladder cancer . The mechanism of how ABO blood type might influence NPC progression remains relatively elusive. Underlying molecular and pathogenic differences play important roles in the effect of ABO blood types on survival. Firstly, ABO gene is located on chromosome 9q34, which is a common region of loss in NPC . Secondly, a study in women showed an association between ABO blood group status and the serum levels of soluble intercellular adhesion molecule-1 (sICAM-1) . The sICAM-1 concentration was higher in women with O blood type, particularly higher than those with A blood type. In addition, the higher serum sICAM-1 concentration was related to the worse survival in NPC . Neoplastic transformation and evolution to metastatic disease are characterized by a dramatic aberration in cellular cohesive interaction. The adhesion molecules were shown to facilitate tumor cell mobility, adhesion of tumor cells to endothelium, neovascularization at the metastatic sites, and host inflammatory response to cancer [33,34]. Intercellular adhesion molecule 1 (ICAM-1) is an inducible cell-surface adhesion molecule, and the ICAM-1/ lymphocyte function associated antigen-1 (LFA-1) pathway plays a major role in a variety of cell-mediated immune responses. It has been reported that ICAM-1 on the surface of cancer cells or antigen-presenting cells (i.e. macrophages) is a costimulatory factor that stabilizes T-cell receptor-mediated binding between these cells and T lymphocytes . Soluble ICAM-1 would work as an immunosuppressive agent by blocking LFA-1 on T lymphocytes, thus rendering it less available for binding with cell-surface ICAM-1 on cancer cells . In this manner, the shedding of sICAM-1 may enhance the metastatic process by escaping host immune surveillance. This process therefore represents an additional potential mechanism for high levels of sICAM-1 in patients with NPC that has metastasized via hematogenous and lymphatic routes. So the higher concentration of sICAM-1 in O blood type patients, may partially explain the poorer survival of O blood type NPC patients. Thirdly, the expression change of serum tumour necrosis factor-alpha (sTNF-α) level is closely related to tumour progression and prognosis in many cancers including NPC [36-38]. Individuals of blood group O had higher sTNF-α levels than others . While, high expression levels of sTNF-α could predict bone invasion, post-treatment distant metastasis and poor overall survival in NPC patients . Further basic researches about NPC genetic, biological differences associated with the ABO blood types are required. Therefore, our next research direction will be for these underlying mechanisms for further exploration and validation. The limitations of our study are related to its retrospective nature. We were unable to collect adequate information regarding the patients' pretreatment plasma EBV-DNA copy number, which has been demonstrated to strongly predict survival . We excluded patients with missing data, such as with unknown ABO blood type. Finally, 233/2439 (11.9%) patients for the entire population, 124/977 (12.7%) and 166/1462 (11.4%) patients with O and non-O blood type were lost to follow up, respectively. O blood type was associated with an unfavorable DMFS in female patients with nasopharyngeal carcinoma in epidemic area, which might contribute to unfavorable OS and DSS in female patients, even contribute to a lower DMFS in the whole patients. It might be beneficial to predict metastasis so as to guide the treatment in female patients with nasopharyngeal carcinoma in epidemic area. This work was supported by the Hi-Tech Research and Development Program of China (Grant number 2006AA02Z4B4), the National Natural Science Foundation of China (No. 31170805) and the National Key R & D Program of Precise Medical Research of China (NO. 2016YFC0904600). The funders had no role in study design, data collection and analysis, decision to publish, or preparation of the manuscript.